FRISCO, Texas (Sept. 12, 2018) - The RoughRiders Foundation logged more than 200 volunteer hours during the month of August, registering another busy month working with the North Texas community. "Each month, it seems we take another step forward and that was certainly the case in August," said Breon Dennis, Executive Director of the RoughRiders Foundation. "It gives me immense pride to see our players and staff contribute to this great community as much as they have been lately. Here's a full breakdown of how the Riders got involved in the community throughout August. * Play Ball event (August 5): In conjunction with Minor League Baseball, Riders catcher Jose Trevino and Frisco Mayor Jeff Cheney helped run a clinic for kids, encouraging them to maintain an active lifestyle. * Habit for Humanity (August 8): Staff members painted the exterior of a home and assisted with other construction projects. * Frisco Fastpacs (August 15): Volunteers sorted and inventoried more than 10,000 goods to be packaged and sent to schools throughout Frisco ISD. * Children's Health visit (August 17): Riders President & General Manager Andy Milovich, and players Wes Benjamin, Tyler Davis, Ryne Slack and Jose Trevino spent the morning playing with kids at Children's Medical Center's Dallas campus. * Keeper of the Game clinic (August 25): Riders players Tyler Davis and Ryne Slack helped with the Keeper of the Game Foundation's special needs clinic at Dr Pepper Ballpark. * Children's Health visit (August 29): Riders players Wes Benjamin, Tyler Davis and Jose Trevino spent their morning with kids at the Children's Medical Center campus in Plano. For more information on how the RoughRiders Foundation is making a difference in North Texas, click here. 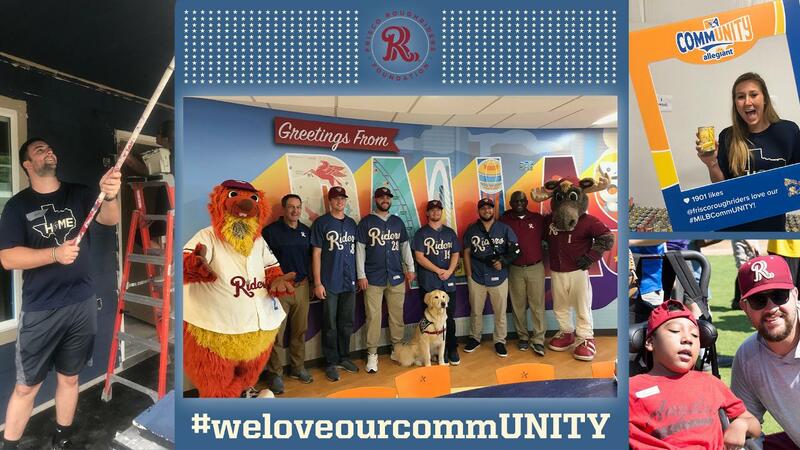 If you would like the RoughRiders to volunteer with your organization, please contact Breon Dennis at (972) 334-1978 or breon@ridersbaseball.com. The 2019 season begins April 4 at Dr Pepper Ballpark. Ticketing information will be distributed soon. For more information, visit RidersBaseball.com.